The Livestock and Land program strives to teach Best Management Practices (BMPs) to area livestock owners by providing educational publications, workshops and hands-on trainings. The program also offers assistance for landowners wanting to construct conservation projects on their properties. Additional services, made available through the RCD partnership with the Natural Resource Conservation Service (NRCS), include free on-site consultations and technical assistance. The NRCS has been a key partner in the delivery and development of this program. Caring for your horses or other livestock can require a considerable amount of time, energy and expense managing manure and soiled bedding. There are several types of composting systems. One type is actively managed systems that require turning of manure. These systems can be on the ground in windrows (as long as there is no risk of runoff going through the piles) or contained in properly sized bins. Newer technology includes aerated systems which force are through stored manure and does not require turning. The RCD has helped landowners install both types of systems and can set up a visit to a facility using one of these systems upon request. Composting manure decreases the volume of waste by over 50%. For a horse owner with limited space this benefit can be very important. Composting reduces the amount of waste going to landfills. Composted manure is easier to handle than rotted manure. 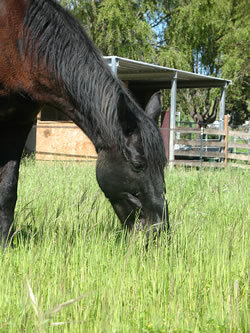 Composting reduces the possibility of parasite transmission between horses. The heat generated during composting kills both worm larvae and weed seeds. Composting reduces fly problems by eliminating breeding ground. Compost is a great soil conditioner, adding organic matter that improves soil structure, drainage, and water retention. Compost provides nutrients to fertilize plant growth. Composting lowers the risk of contaminating surface and ground water. Composting makes your property more "desirable," especially to your neighbors. Muddy paddocks and pastures can create safety and health hazards for animals and their owners, deteriorate property values, and harm the health of local creeks and waterways. 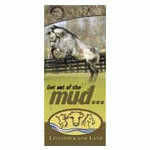 Mud is fine organic material and is designed to hold moisture. When we combine manure, organic soils, spend hay and shavings, and runoff or rain, add to it the crushing power of a thousand horse, we get mud. So what can we do? Manure Management: While this might seem obvious, it doesn’t take long for manure to build up and make clean up and difficult and sometimes impossible chore during the rainy season. In confined areas it is recommended that manure be picked up one to three times per day. Manure that is not composted should be stored under cover and in an area that is will not have contract with stormwater runoff . This can be accomplished with something as simple as a tarp or a properly sized manure storage area that has a roof. Storage areas should be sized based on number of livestock and frequency of manure hauling to a proper disposal site. Drainage Management: A commonly mantra is “keep clean water clean.” This means not allowing excess runoff to travel though areas that contain manure. Runoff from roofs, adjacent hillside, and other impervious services are culprits. The RCD and NRCS can help livestock owners understand drainage concerns on their properties and guide the development of proper drainage structures and management practices to reduce mud. Some techniques include routing roof downspouts away from paddock areas, making sure paddocks are not in drainage courses, and installing swales or other features that keep clean water clean. 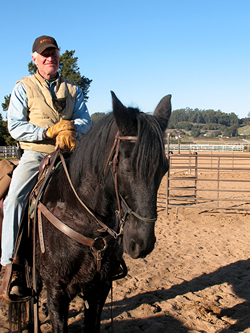 Many horse and livestock owners in Santa Cruz County have dry, non-irrigated pastures. Cattle or other livestock owners may use these as primary forage sources whereas horse owners normally use them for exercise areas and limited forage. The main concerns when managing pastures are overgrazing and erosion. Both lead to decreased infiltration of stormwater water and increased potential for sediment and nutrients to reach local creeks. The first step in managing pasture is defining what is really a pasture. Not all areas on a ranch or horse facility can be expected to support vegetation. It’s important to create areas, called “sacrifice areas” that are not vegetated because of heavy use by animals. These areas will use different measures to reduce runoff (see mud and manure management). For true pasture areas, you will need to understand how properly graze the area to keep vegetation intact. This includes managed grazing practices such as timing, rotations, and seasonal use. Understanding how to “grow grass” is another fundamental component of pasture management. The RCD and NRCS can provide information on various seeding options and techniques for managing pastures and weeds. 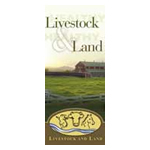 The RCD can provide advice and assistance regarding livestock management on your property or ranch. Federal, State or local funding may be available. Contact us for more information.